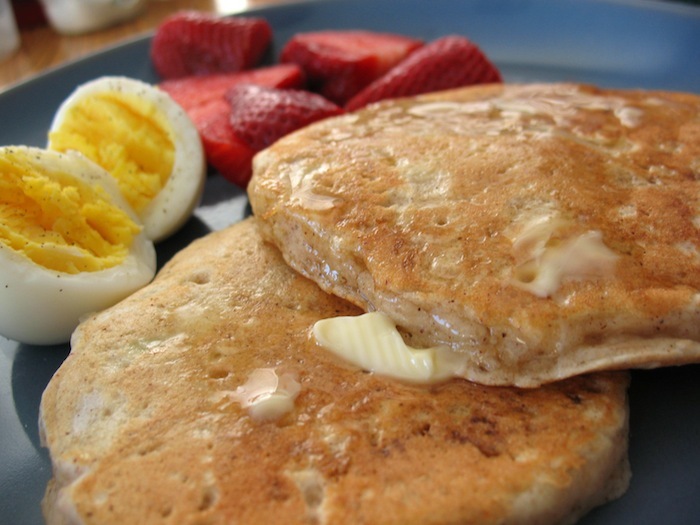 Pancakes are great on a cool fall morning, and a wonderful way to get the kids into the kitchen. Have them crack the eggs, stir and measure. Before you know it, you’ll be able to hand the entire job over to them and sit back while they whip up some hot, fluffy, pancakes for your breakfast. Some boiled, poached, or fried eggs are always good on the side, and if you really want to have the full monty, get some bacon going in the oven. If syrup isn’t your thing, pancakes are also great topped with fresh fruit, yogurt, curd, or whatever spreads and sauces your heart desires. Philadelphia Cream Cheese has an amazing chocolate cream cheese for your sweet tooth, or you can just go with maple syrup. These particular pancakes take advantage of fall apples, some healthier flour, and buttermilk for flavour. I highly recommend that you don’t substitute the buttermilk for plain milk, because the buttermilk adds some great flavour to the batter. I also recommend eggs on the side because, well-eggs go with anything, right? In a large bowl, whisk together the flours, sugar, baking powder, cinnamon, baking soda and salt. Set aside. In a separate bowl, whisk together the eggs, buttermilk, and butter. Pour into the dry ingredients and stir until just combined. Squeeze the liquid out of the grated apple and fold into the batter. Make as usual for pancakes-on a lightly oiled nonstick pan, cook over medium heat until small bubbles are breaking on the surface. Turn over and continue to cook until nicely browned. Keep the pancakes warm as you make them by placing them in at 170°F oven in a single layer on a cookie sheet. This recipe turned out great. #kidapproved!